Did you know you can make money by entering sweepstakes on Instagc? When I started sweeping, I ran across this website and was immediately hooked. It was a great place to find sweepstakes while I made extra money from home. I spend about 3 hours on Instagc a day, and in that time I am constantly entering giveaways while I am doing free offers. I would say I enter about 50 sweepstakes in the 3 hours of doing free offers. I also make $25+ in cash I transfer to my Paypal account each day. On this screenshot you can see one of the offers is to “Enter for a chance to win $100 Best Buy Gift Card”, now when I went to do this offer I made sure it was 100% legit by looking at the rules on the bottom of the screen. I checked the terms and conditions. Always check the terms. So for this offer, you just have to register your email. (I would suggest using an alternative email address) After you register, you will receive $0.32 or 32 points. After the registration page, you can go to the sweepstake rules section and instead of going through the pages of offers, you can just enter your email to enter the sweepstake. It’s that simple! There are some offers with sweeps that require you to go to the very last “offers” page. You will be entered into the sweepstake, and you can answer no to everything and skip those pages as well. Don’t ever pay to enter a sweepstake, or get your money on Instagc. I hope this quick tip is valuable to you. 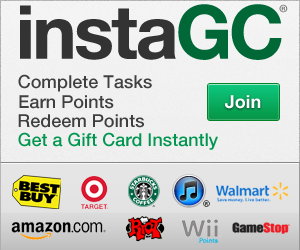 If you’re not a member of Instagc, you can sign up free and start earning points and sweeping! I have not heard of this site before. Thank you for the review! This is a new one on me. I enter on blogs generally because enjoy bloggers quite a bit and their posts.I used to enter sweepstakes but never ever won a thing and got tired of running through offers. Mind you I dont win much on blogs either, but have met some nice folks. Perhaps I will look into this one. I haven’t heard of this one either.I usually enter on blogs but I am going to check this out! I have not heard of InstaGC yet, thank for sharing. Wow I have not heard of this before. Sounds interesting plus I love entering sweepstakes. I haven’t tried this yet. Sounds interesting — will check it out.